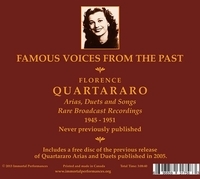 �Florence Quartararo was born in the San Francisco Bay area, to music loving Italian parents and grew up listening to old vocal recordings and such visiting luminaries as Martinelli, Gigli, Schipa, Rethberg, Ponselle and, her greatest favourite, Claudia Muzio. Inevitably her own voice was discovered and she began her vocal studies which led finally to her becoming a prot�g�e of Bruno Walter. He brought her to the attention of the Metropolitan Opera where she made a successful d�but as Mica�la in 1946. Here she remained for a few seasons, always seeking to improve her art and garnering ever greater praise for appearances in works such as THA�S, FAUST, PAGLIACCI, TRAVIATA, GIANNI SCHICCI, etc. It was when singing Lauretta that she met the baritone, Italo Tajo, whom she married. Following the birth of their daughter, he persuaded her that two singers in a family was not a good idea and thus she left the operatic stage still only in her 20s. The ridiculously few commercial recordings of this hugely gifted soprano were always a source of deep regret for voice lovers. Only a handful of Victor 78s, and one 'live' PAGLIACCI remained to represent a brilliant singer, once compared to stars such as Ponselle and Milanov. All of these original recordings are included here. To listen to just one - 'Care Selve' from Handel's ATALANTA, is to realise instantly the great loss her early departure from the operatic stage occasioned. The voice has a thrilling individual timbre, is intrinsically lovely, even-scaled, flexible and always used with high intelligence to dramatic effect. It is necessary to return to Alma Gluck's celebrated version to hear singing and phrasing of this order. Thanks to Richard Caniell who knew the soprano in her retirement, we are now able to hear numerous recordings from her private collection. His fascinating notes that accompany this splendid tribute are of absorbing interest and a further long essay from Henry Fogel is also a model of how to tackle an issue of this nature. "Intriguingly, Quartararo was Toscanini�s first choice for his Desdemona, but Edward Johnson refused to release her from her contract with the Met�.The soprano is something of a revelation, her Italian heritage manifesting itself in her idiomatic performance, her coloring and lyricism, and her power, yet ease, of production. 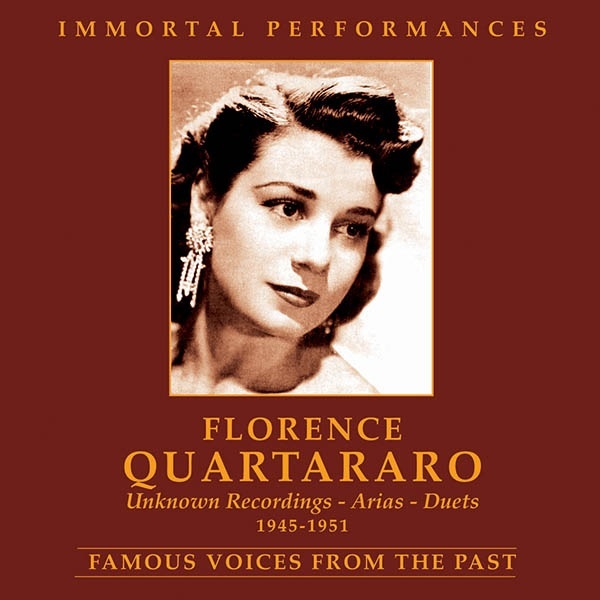 Quartararo�s was a voice suited to veristic opera....Lamentably, the attractive California-born soprano...left a somewhat lean discography....Her legacy includes only a handful of commercial recordings and a number of radio broadcasts, several of which remain unpublished." �Florence Quartararo possessed the kind of voice that we never have enough of (particularly today), a true spinto whose singing combined the best virtues of the lyric and dramatic sopranos. She had the ability to spin a smooth, even legato, but at the same time the dramatic thrust and weight, carried all the way to the top of the voice, to make a major impact in the big roles. That she sang for only four seasons in 37 performances at the Met is a loss for all of us. Richard Caniell has done the world an important service by issuing so much of her material, a great deal of it given to him by the soprano herself when he interviewed her in 1982. As we listen to these recordings, one cannot help but be impressed by the breadth of her repertoire and her ability to be comfortable in all of it. Her recording of Handel�s �Care selve� is generally considered a classic, worthy of standing alongside Alma Gluck�s [famous rendition]. The evenness of tone and legato is a model of the vocal art. Set against that classical poise there is the passion, the natural sense of phrasing and idiomatic style, of her singing in the verismo repertoire. Listen to the opening of �La mamma morta� to hear someone who knows exactly how to shape the phrases of Giordano�s music, and how to convey the desperation of Maddalena. Quartararo�s voice was not the plush, velvety soprano of a Tebaldi. It was rather a darker, more tightly focused sound. Some have compared it to Ponselle, others to Milanov. Like all great artists, Quartararo was unique in her sound combining both brightness and darkness in a way that few have. One cannot imagine Milanov or Ponselle as Mica�la, for example, but in her recording of the CARMEN duet she produces just the right vocal color for Bizet�s music and Mica�la�s character. Above all, the voice had a glow. The one complete role we have, Nedda in PAGLIACCI from a 1948 Met broadcast, shows her vocal versatility and keen dramatic instincts. One will rarely encounter a more naturally phrased and flowing �Ballatella�; then, her interaction in the final scene with Vinay�s Canio is positively gripping. She shows tenderness in the duet with Silvio, and before that, in the duet with Leonard Warren as Tonio, we get to hear her holding her own against a truly major voice�. Toscanini wanted her to sing Desdemona on his recording of OTELLO, but the Met�would not release her for the extensive Toscanini rehearsal schedule. Contrastingly, she provides elegance and classical poise in the Countess� �Dove Sono� from NOZZE, a beautifully spun legato in Rachmaninoff�s �In the Silence of the Night�, and richness and weight for Santuzza�s �Voi lo sapete�. One of the most successful recordings in this collection is Quartararo�s singing of Violetta�s big scene that ends Act I of LA TRAVIATA. She produces a grand, generously phrased line and, at the same time, has the agility required in �Sempre libera�. And most importantly, she poignantly and effectively conveys Violetta�s inner conflict, and in particular the forced gaiety of the cabaletta. One of the most striking elements of the material on these discs is how equally comfortable Quartararo was in the French and Italian repertoires. Not only the aforementioned Mica�la-Jos� duet, but her shattering �Pleurez, mes yeux� (LE CID) and exquisitely sung �Depuis le jour� (LOUISE) demonstrate her ability to produce the brighter, more focused tone appropriate for the French style, with a slimmer vibrato than the one she applies in, for example, the ADRIANA LECOUVREUR arias. This ability to adapt her vocal production to different musical idioms would be impressive in a singer with ten or fifteen years more of experience behind her. In someone this young it is little short of amazing. The purity of tone, and the glow to the sound in �Depuis le jour� is quite extraordinary.